Easter has crept up super fast this year, so here’s a quick top 10 list of things you could quickly grab to help celebrate Easter with your family. Thanks to Margaret Pritchard Houston for this really creative list of Easter toys and ideas of things to do with them. Do also check out her online Christian toy shop, Mustard Seeds Kids. 4-in-1 Easter Storytelling toy £34.95. This toy helps you tell the whole story, and offers all kinds of possibilities for your child to play. Starting with Jesus on the donkey, and including a Last Supper section with a removable Jesus figure, bread and wine, and a towel and bowl for foot-washing, then continuing on to the cross and the tomb, this resource can be a treasured part of Holy Week at home. Easter Eggs are an ancient symbol of new life, and a traditional part of Easter celebrations. Myriad Natural Toys sells natural plant-based dyes and watercolour egg painting sets for only £2.95 each. The wonderful author and illustrator Tomie dePaola has created an Easter calendar to help children celebrate all 50 days of Easter. With links to Bible verses, the “Garden of the Good Shepherd” helps families explore the whole season of Easter, not just the one day. This unbreakable chalice and paten set can allow for imaginative spiritual play around the Last Supper and Communion in general. £37.95 – but it will last forever. 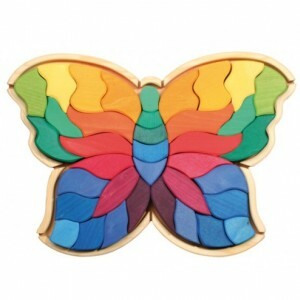 The butterfly was used by the Medieval Church to help explain resurrection. The caterpillar appears to die, to go into its chrysalis and be buried, but then it miraculously emerges – not as its old self, but as something new and glorious, with a new kind of life. Using this metaphor in a hands-on way can help children understand the idea of Jesus’s resurrection. Insect Lore provides butterfly growing kits for £20.00 – you get a safe enclosure, 5 caterpillars, and food (though you can always provide more). Once the caterpillars have hatched into butterflies, take them to your nearest park and set them free. My company, Mustard Seed Kids, has a range of puppets that connect to the Easter story.From finger puppets of caterpillars and butterflies, and Easter chicks, to larger puppets of lambs (the lamb of God, sacrificed at Easter to give life) and donkeys for Palm Sunday, ranging in price from £3.50 to £10. We also carry an Easter magnet playset – with 18 magnets and a storytelling magnet board, children can play with the whole story of Holy Week and make it meaningful for themselves. Please note that due to demand, stock of this item is currently low and I can’t guarantee delivery for this Easter, though I will, of course, do my best. Easter has proven to be fertile ground for wonderful children’s books, so I’m going to finish with three of the best. The children at my church ask for these ones year after year.The first is Patricia Polacco’s wonderful Chicken Sunday – a story of celebrating Easter in community. The narrator, a Russian-American girl, and her two “brothers” (neighbours and best friends) want to get their grandmother the Easter bonnet she longs for. When they go to the Jewish hatmaker’s shop to see if they can do chores to help save up, they find bigger boys throwing eggs at the shop – and they get blamed. What follows is a heartwarming story of love, peacemakiing, and understanding, centred around Easter in church. Everything Brian Wildsmith writes is incredible, and the details in his illustrations will keep children engaged time and time again, finding something new. His Easter story is told through the eyes of the donkey that carries Jesus into Jerusalem, but avoids becoming twee or sentimental. The profound mystery of Easter, and the awe and wonder surrounding it, are at the heart of this beautiful book. The Tale of Three Trees is a folktale about three trees who stand on a hillside dreaming about what they will become. One wants to be a treasure chest and hold the greatest treasure in the world. The second wants to become a ship for the greatest king in the world. The third wants to stay on the hillside and point towards heaven. But they get cut down and made, instead, into a feed box for animals, a boat for fishermen, and a cross for criminals.Can their dreams still come true? A tale that could easily become preachy and moralistic, in this telling, is full of sacred mystery.